Part of the African section of the Tin Miners' Memorial Garden at Geevor Mine, Spring 2017. I have always had a passion for growing things. 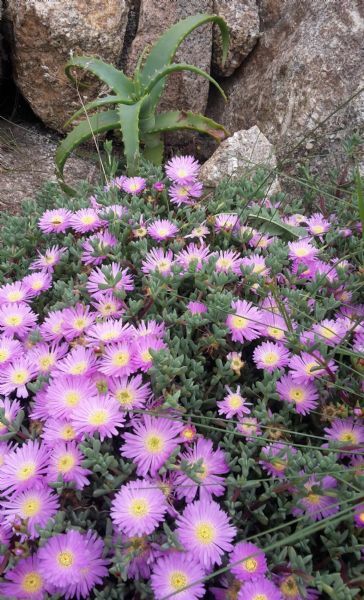 This all began as an 8-year-old growing cacti on my windowsill in our London council flat. Now I am custodian of almost an acre of garden and woodland with huge granite outcrops in the far west of Cornwall; somewhere I can now grow succulents and other exotic plants outdoors. This has all gone hand in hand with my development as a 3-dimensional artist, first as a potter and now as a sculptor. I think that when one approaches the design of a garden, or part of a garden, it warrants the same considerations as a sculpture in that every element needs to work from every available angle or direction. Gardens are living sculptures. It is also very exciting and challenging in that many elements of these living sculptures only reveal themselves seasonally or with time as plants mature from sapling to tree or shrub. Working in my own garden, on the very steep north-east side of the Lamorna Valley, with sometimes fierce coastal winds from the south and east, shelter planting is also an essential consideration. This was particularly challenging in designing the Cornish Tin Miners' Memorial Garden at Geevor Mine on the north Cornish coast, with winds from every direction. 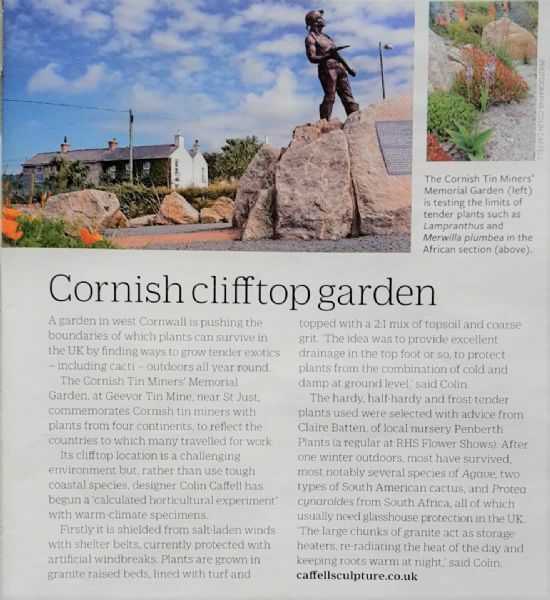 Cornish tin mining and garden design might seem like strange bed fellows but that is exactly what I have brought together in the creation of a memorial to West Cornwall's hard rock miners outside the gates of Geevor Mine in Pendeen. Geevor was the last remaining tin mine to close on the Atlantic coastal plateau. It has been a long held dream of the former mining community of the St Just Mining District to have a statue to commemorate the centuries old mining heritage of the area. Following a long process of public consultation in which my design and a site were chosen, this community project has finally come to fruition. In creating a 7-foot bronze resin figure of a Cornish miner, I felt the creation of a garden around the statue would not only provide a sense of privacy, a place for quiet reflection; it would also further represent the pioneering spirit of Cornish mining families who took their skill and technical expertise to the far corners of the world as new mining opportunities emerged. 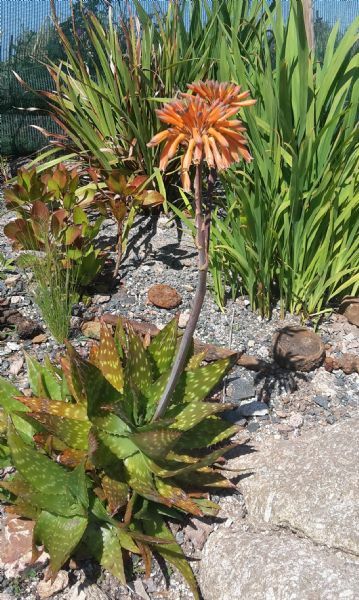 This has been achieved symbolically by planning the planting scheme according to four continental regions that Cornish miners travelled to over the centuries: the Americas, Africa, Australia/New Zealand and Asia. It has long been said that wherever in the world there is "a hole in the ground�, there will always be at least one Cornish man at the bottom of it. Lines of iron stained rock and gravel taken from the last haul from underground at Geevor bisect the garden, representing not only the lodes of precious ore but bloodlines that run through generations of local mining families. In a way, the combination of statue, hard landscaping and the planting is the sculpture. The overall final effect, with the ocean and former mine workings as a backdrop, is very dramatic. It certainly promises to become one of the iconic attractions in Cornwall. This project has been entirely funded by the communities of St Just and Pendeen, for the community, and driven by the tireless efforts of a small committee of volunteers over a number of years. It has only been by their enthusiasm and commitment that numerous others have also volunteered their time, skill, knowledge, materials and resources to help make all this happen; from metal fabricators, stone masons, digger and crane operatives to local Chelsea gold medal winning nurseries (Penberth Plants and Kelnan Plants) with generous donations of plants and knowledge. Most of the money was raised through local activities including, choir and silver band concerts, an art auction, a dare-devil extravaganza and countless coffee mornings and pub events. I was even allowed to set up studio in the old ball-mill area of Geevor Mine, to create the statue in public in order to both raise public awareness of the project and generate further donations from people passing through. This was a huge success. 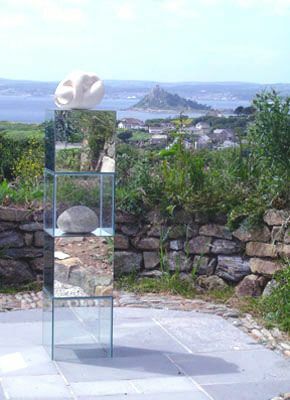 I am aware that one couldn't choose a more hostile environment to site an exotic garden - with very strong salt-laden winds off the Atlantic and cold north and easterlies off the moors in winter - but it has been done before at Eagle's Nest, just up the coast where artist Patrick Heron lived. We are fortunate, however, that in the far south-west the actual climate is conducive to sub-tropical planting, if done properly. It is a calculated horticultural experiment that will require great patience as we establish shelter belt plants indiginous to each continental region and provide artificial protection in the meantime. 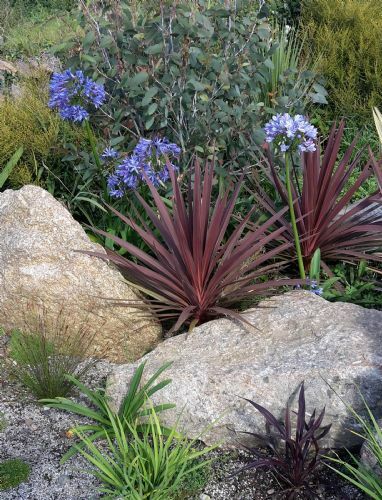 For example, I am using the sprawling Ceonothus thyrsiflorus v.repens to bring the colour of the sky and sea down into the garden but, even though it is Californian, it doesn't really like salt winds, so I am planting deep crimson hardy fuschias from Mexico as a wind filter between them and the sea. The combined colour, I hope, will create the effect of a spectacular Cornish sunset in the garden, especially with the addition of golden orange Californian Poppies as part of the palette. 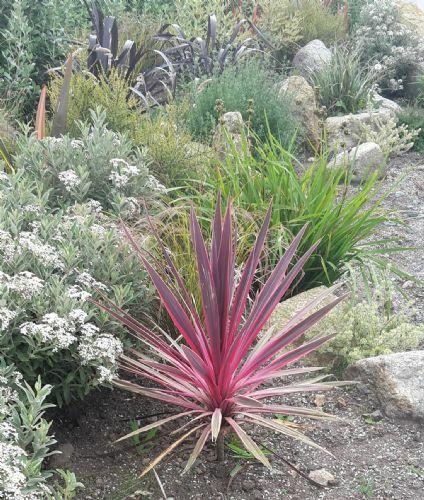 I am very excited that Claire Battens of Penberth Plants, also a member of the RHS Tender Perennials Committee, is keen to document the progress of this 'experiment' over the coming years. Another device I have developed over a period of time are the Geo-Cubes, which are mirror and clear glass modular installations designed to bring light into darker areas of a garden by reflecting light external to those places. They also act to bring those other areas or vistas unexpectedly into view, framing even one's own surprised face. They add almost invisible geometric structure into the more fluid natural world of plants. 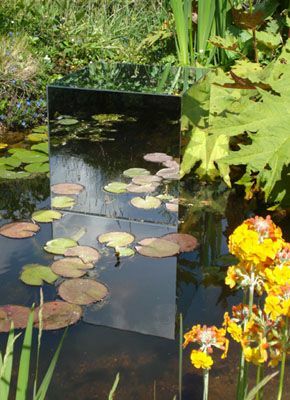 By reflection they can also visually increase the volume of plant stock in their immediate vicinity. Interestingly, the large ones also float in a pond, drifting on an even keel very evenly.